It's a question of whether you come and buy my B&O store in the basement. Here speaker setup changes if the WiSA - 5.1 speakers are to be activated. (Her BeoLab is not used) LG's TV speaker becomes disconnected. According to what was to be written. 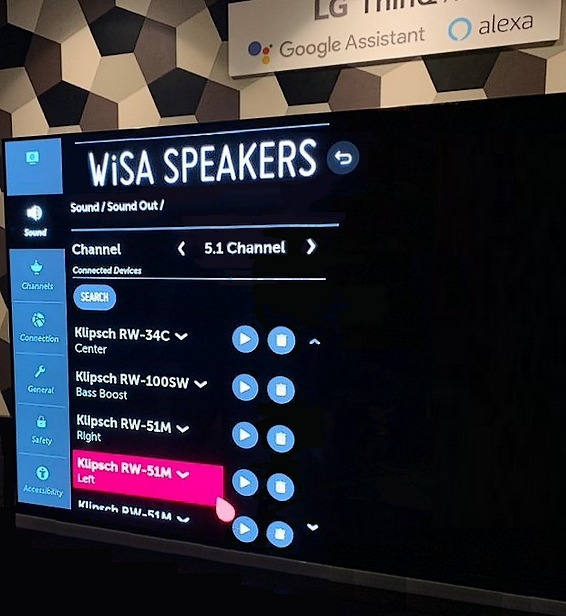 All LG-2019 models will receive WiSA integration. (Her BeoLab is not used) LG's TV speaker becomes disconnected. According to what was to be written. All LG-2019 models will receive WiSA integration. So, this confirms that the LG internal speaker cannot be used as center speaker? If so, that wouldn’t be interesting for me as that’s what’s always been the #1 selling point for the b&o tvs. This has been covered before I'm sure. With the new LG TV's using the WISA dongle means that a centre channel WISA speaker is required - i.e. the WISA dongle implementation will throw all 5.1 channels to wireless / WISA speakers. You can't use the LG TV's own speaker as the centre, and WISA speakers for the rest - its not mix and match. choose a WISA dongle. But have you some alternatives if you want to use the BeoLab Speaker ? to our BeoVision TV. - - What do you want to do steve1977 ? Just saying that the LG solution is not attractive to me and does not provide a good solution to use wisa beolabs. At least not for me. It brings me to three potential solutions that would be attractive to me (as said, the LG solution is not). 1) Some tv maker brings a wisa enabled television that allows to use the tv speaker as center speaker. If not LG, maybe some other tv maker may do at one point. Absent future Beovisions, as seems highly likely, there will be ways to do 5.1 with a 3rd party screen and a bunch of BeoLabs. Option 1 ? You'll be waiting a long time for this, I would suggest. Option 2 is pretty likely, from what I understand from B&O. The current LG WISA implementation goes no way to replicate the audio processing / distribution capability of current Beovisions. But something will come from B&O, more or less in line with your option 2. My wife and I have fallen in love with LG roll TV in 55 ". With WiSA 5.1 connection. Then there will be plenty of time to wait for a wireless center speaker from B&O. Well, this is interesting technology: see what LG is doing with its OLED G8 mobile phone. LG are introducing crystals sound on a few of their TV's as well, from what I remember from CES. They don't do the Wallpaper in 55, what make you so sure the rollable will be sized down to 55"? I’m also pretty sure that the won’t do it in 55”. They don't do the Wallpaper in 55, what make you so sure the rollable will be sized down to 55" ? LG-TV-OLED65R9 - is just the first. When implemented, it will rollable be 55" next. This has always been the case. Indeed, and as I've said before, dreams are not real. And yes, the rollable, like the wallpaper are extremely premium offerings from LG - as such, they are very unlikely to make a 55 inch (i.e.more everyday) version. It will follow the same path as the Wallpaper, i.e. larger sizes only. If they offer different sizes, it will be very very far down the road. And its more a standalone product being multi channel in itself, and coming with a large box. Adding an additional centre channel just ruins the look. The Wallpaper was not the right choice to integrate in a 5.1 set up, given its form factor...and the rollable will be the same. Get an E series LG for a 5.1 setup, or a Panasonic 800 OLED (without its speaker blade) - the higher models have speakers that don't make a great deal of sense in a 5.1 setup with BeoLabs. But hacks will be hacks I guess.